Fine art pet portraits in Pen & Ink with watercolor. You know that better than anyone. You also know that a photograph, although it may accurately portray your pet's appearance, usually can't quite capture his or her personality, spirit and inner qualities. As a professional portrait artist, I take pride in creating artwork that conveys not merely the physical likeness of my subjects but also the individuality that makes each one unique. Have I already done a portrait for you? 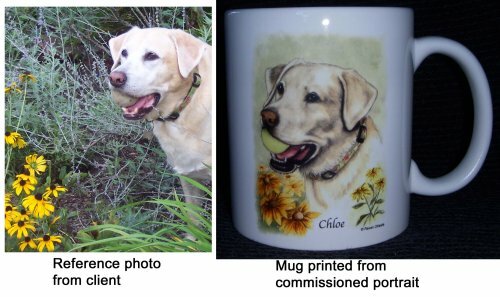 How about a mug with your portrait on it like this? Mugs are $20, email me to find out if I still have a copy of your portrait.